Please have a look to the Heated Pools in Italy swimmers like you have reported. Is your pool not listed? Contact us to ADD IT. It is free of charge! Are you on holiday and would like to keep fit and healthy? 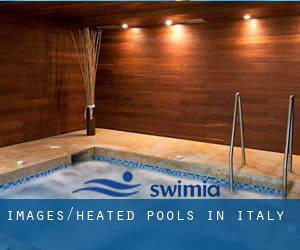 Swimia.com gives you the very easy and quickest way to find pool near Italy. Are you a standard swimmer? Do you visit the identical Swimming Pools? Please check that all the information for your aquatic center are correct and contact us when you come across any mistake. There are often discounts available to senior citizen and little children. Find out by contacting your nearest pool in Italy. The most effective pools to swim are surely indoor olympic pools. We currently have the following Heated Pools in Italy, but we are often grateful for any corrections or contributions. Get in touch via our get in touch with form. Let us tell you a secret to switch off whilst you're in Rome: just choose a Pool in Rome and plunge into the water! There's no extra powerful approach. Swimming is really a terrific idea to keep your body active during your visit to Naples (Italy), or even in case you are a local. Swimia assists you to discover your closest Swimming Pool in Naples. It's difficult to visit Italy without having dropping by Milan (with 1.306.661 residents). Presently Swimia is showing you all the Pool in Milan and the closest pools situated in its vicinity. Holding an estimated population of 865.263, Turin is among the most important cities in Italy. Check all of the Swimming Pool in Turin and its surrounding region. Whereas Genoa is one of the six most populous cities in Italy with almost 601.951 residents, you shouldn't miss that one if you're going to Italy. Without a shadow of a doubt, swimming in Palermo may be the most beneficial way to unwind right after work. Take a couple of minutes to browse Swimia's catalog to find a Swimming Pool in Palermo. Updated on 2019 Viale Ovidio, 3 , L ´ Aquila (Postal Code: 67100). This sports center gives 25 meters, 6 lanes, Indoors. Contact facts for this Swimming Pool such as phone number and email address are number. Updated on 2019 V.le dello Sport , Cittadella (Postal Code: 35013). This sports center gives 25 meters, 6 lanes, Indoors. For this Swimming Pool, only phone number is number here. Updated on 2019 Via Giacomo Matteotti n°45 , Mirano (Postal Code: 30035). Among all of the activities offered by the center, if you are interested in swimming you can get pleasure from 25 meters x 15 meters, 6 lanes, 1.6 meters depth, 1.6 meters depth, Indoors. If you need to contact this Pool, e-mail address and phone number are both number. Updated on 2019 Via Copelli, 7 , Varese (Postal Code: 21100). Swimmers like you reported 25 meters x 16.6 meters, 7 lanes, 1.8 meters depth, 1.8 meters depth, Indoors. Phone number and e-mail address are number for this Swimming Pool. Updated on 2019 Via Montevideo 20 , 6th Zone , Milan (Postal Code: 20144). Swimmers like you reported 25 meters x 10 meters, 5 lanes, 1.2 meters - 1.9 meters depth, 1.2 meters - 1.9 meters depth, Indoors. Unfortunately we do not have the email address of this Pool, but we can give you the phone number. Updated on 2019 Corso Calatafimi n.326 , Palermo (Postal Code: 90129). This sports center gives 25 meters, 4 lanes, Indoors. For this Pool, only phone number is number here. Updated on 2019 Corso Matteotti, 10 , Luserna San Giovanni (Postal Code: 10062). Swimmers like you reported 25 meters x 12.5 meters, 5 lanes, Indoors. Unfortunately we do not have the email address of this Swimming Pool, but we can give you the phone number. Updated on 2019 Via dello Statuto, 43 , Zona Ospedale , Bergamo (Postal Code: 24128). Swimmers like you reported 33 meters with a bulkhead usually set at 25 meters, 8 lanes, Indoors. Phone number and email address are number for this Swimming Pool. Updated on 2019 Via Giochi del Mediterraneo 20 , Naples (Napoli) (Postal Code: 80125). Swimmers like you reported Olympic size x 21 meters, 8 lanes, Indoors. Unfortunately we do not have the e-mail address of this Swimming Pool, but we can provide you with the phone number. Updated on 2019 Largo G. Onesti , Rome (Postal Code: 00197). This sports center offers Olympic size x 20 meters, Indoor/Outdoor. For this Swimming Pool, only phone number is number here. Updated on 2019 Via San Benedetto, 107 , Cagliari (Postal Code: 09126). Swimmers like you reported 33 meters x 21 meters, 8 lanes, 1.8 meters uniform depth, 1.8 meters uniform depth, Indoors. Phone number and email address are number for this Pool. Updated on 2019 Viale Kennedy, 38 , Novara (Postal Code: 28100). Among all the activities offered by the center, in case you are keen on swimming you are going to take pleasure in 25 meters, Indoors. Just in case you need to contact this Swimming Pool before dropping by, we only know the phone number. Updated on 2019 Via Lamennais, 20 , 7th Zone , Milan (Postal Code: 20153). Among all the activities offered by the center, for anyone who is considering swimming you will appreciate 25 meters x 15 meters, Indoors. Just in case you would like to make contact with this Swimming Pool before dropping by, we only know the phone number. Updated on 2019 Via Capo Sile, 123 , Caronno Pertusella (Postal Code: 21042). Among all the activities provided by the center, should you be considering swimming you might take pleasure in 25 meters, 5 lanes, Indoors. If you will need to contact this Swimming Pool, email address and phone number are both number. Updated on 2019 Viale Aldo Moro, 60 , Casalecchio di Reno (Postal Code: 40033). Swimmers like you reported 25 meters x 10 meters, 1.2 meters depth, 1.2 meters depth, Indoors. Phone number and e-mail address are number for this Swimming Pool.